History is one of those "required" subjects that many students describe as dull and boring. But learning history can be fun and exciting, especially if you approach it with the right attitude. George Santayana, a Spanish philosopher, said that those who do not learn from history are doomed to repeat it. In other words, if you fail to learn from past mistakes you're likely to make them yourself. But there are many other reasons to study History. In addition to providing a knowledge of the past, studying history helps develop transferable skills that will prepare you for a variety of career opportunities down the road. So now that you're pumped about learning history, let's explore some useful techniques and strategies that will improve the effectiveness of your studying. It may seem obvious, but we're going to point it out anyway–history is based on a chronology of events. The order in which events occur is central to the study of history. Consequently, it's very important that your notes are in chronological order. When organizing your notes, divide them by (1) topic, (2) then years, (3) decades and (4) centuries. History is full of facts, events and details. In fact, there is so much information to learn and memorize it may seem impossible at times. One of the keys to studying and learning history is to establish connections between facts. The best way to do this is to start by developing an understanding of the big picture and then working your way down to the detail. During your lectures, and while reading your textbook, always try and place events, facts and details within the context of the big picture. How do they fit in? Why are they important to what's going on? How do they support the sequence of events occurring? There isn't anything you can't memorize or learn if you employ this technique. 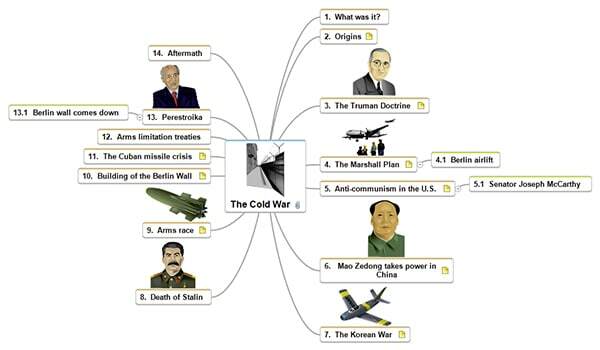 Employing mind maps is another effective strategy for visualizing historical information at a glance and making connections. Mind mapping literally enables you to map out historical information, events, and ideas using symbols, words, colors and images in a logical manner that brings clarity, improves understanding and will enable you to memorize large amounts of information. After creating your mind map, develop the ideas and connections you now see into usable notes. Then complement your notes with what you pick up from reading your textbook and listening to classroom lectures. Even though we recommend studying and learning key data within a contextual understanding of the big picture, sometimes rote memorization techniques and strategies are required to order to memorize key dates, names and events you're likely to see on your history exam. In such cases, flashcards are an excellent tool for memorizing information, improving recall, and testing your level of retention. To create a flash card, on one side of a 3 x 5 card, write a key event, date or fact. On the opposite side, write the definition, description or explanation. The use of flashcards for memorizing is age old. But it's just as effective today as it was one hundred years ago. That's right! Watching movies can be an effective method to learn and study history. There is an array of films and documentaries out there that accurately depict historical events. While educational, most historical films and documentaries are also very entertaining. Unfortunately, some films that depict historical events are not true to historical fact. "Schindler's List", which depicts the German-occupied Poland during World War II, offers a somewhat accurate historical portrayal. Unfortunately, the movie "Brave Heart", as moving and entertaining as it is, isn't historically accurate. If you're serious about learning history, make sure the movie you select is true to historical fact. The majority of history is captured in written text. So it's not surprising that to learn history requires a fair amount of reading. But reading more doesn't necessarily mean you'll learn more. The key is to extract the most amount of information and knowledge from your history text as possible, as efficiently as possible. History textbooks are made up of words, but not all words are equally important. By discovering the hierarchy of words you can extract up to 75 percent of a textbook's content while only reading 25 percent of the text. Start by reading the title. The title of most history books is going to offer the most insight into the central argument of the book. For example, The Origin of Species by Charles Darwin gives you immediate insight into what the book is about, where different species of animals came from, and how they evolved. Not every title is going to be so descriptive and straight forward, but it's worth taking the time to discover why the author chose the title. Now open up the book and review the chapter headings listed at the beginning. Depending on the type of history book you're reading, the chapter headings will most likely be organized in a chronological order of events, or in a fashion that will provide additional insight into the structure of the argument being presented. Reading the chapter headings will provide you a quick overview of what the history book is all about. Before delving into the body of each chapter, take a few minutes to read the introduction and conclusion to the chapter. The introduction and conclusion are often the most important, and insightful, parts of the chapter. Here the author will provide a summary of the main arguments, the research presented in the chapter, and the conclusions reached. Reading the introduction and conclusion before reading the chapter body will (1) provide you a better context for understanding and interpreting the information presented and (2) help you make connections between what you read and the author's arguments. The chapter introductions and conclusions in history books may be clearly identified by a boldface heading or blank line, or simply be the first and last paragraphs of the chapter. It's not uncommon for history books, textbooks in particular, to have chapters that are subdivided into sections organized both topically and/or chronologically. When a chapter is broken down into sections, each section is usually identified by a boldface heading followed by a blank line, or by using boldface text for the first sentence of the paragraph. Quickly reading the section headings before jumping into the body of the chapter will give you a better understanding of the main idea(s) that are presented in the chapter. Again, remember, as we pointed out previously, you want to develop an understanding of the big picture first and then work your way down to the detail. The next level of hierarchy in most history books is the first sentence of each paragraph. The first sentence of the paragraph is used to introduce the author's main point, while the following sentences provide supporting evidence and analysis. In a typical history textbook, reading just the first sentence of each paragraph will provide a summary of the entire chapter. And don't forget to review all illustrations, including photographs, maps and charts. If the author included them, he did so for a reason. Once you've read the title of your history book and discovered it's significance, reviewed the chapter titles at the front of the book, read the chapter heading, introduction, conclusion, section headings and first sentence of each paragraph, you'll have a good idea of the author's point of view. Now it's time to sit down and read the body text, examining key data, events, and information, in order to develop your own understanding and opinion. What argument is the author trying to make? What evidence does the author use to support her argument? Is the author's argument persuasive? Why? Or why not? What is important to the author? Where did the author's information come from? Primary sources? Secondary sources? Did most of the material presented come from just one source? How does the book fit into my course? Why did my professors assign this book? Does the book support what I'm learning in class? What do I like about the text? What don't I like? Why? As you read, it's important to take notes. If you own your textbook and don't plan on selling it, we recommend jotting down your thoughts, ideas, and insights in the margins of each page as you read. If you don't own your book, or plan on selling it once you've read it, then you'll need to take notes elsewhere. Good notes will ensure that you'll be prepared for your next essay or exam where you're knowledge, understanding and work will be tested and evaluated. Class starts and you professor immediately begins talking about the Antebellum era, the period in the history of the United States, from the late 18th century until the beginning of the American Civil War in 1861. He's excited and the information just flows from his mouth. You listen for a few moments and then start taking notes. You write down everything he says. By the end of class you have five pages of copious notes. You captured the entire lecture on paper! You're hand is cramping and you feel like you just ran a marathon. Only one problem. You didn't listen to a word he said. This type of note taking is a common problem among students who are so afraid they'll miss something important they write down everything their professor says. It's an especially common practice among history students who aren't sure what's important and what's not. The key to taking notes in history class is to write down only those things that are genuinely significant. But how do you do that? The following are keys to effective note taking in your history class. Arrive at class having completed all assigned readings. The more prepared you are when you arrive at class the easier it will be for you to follow along and take good notes. Typically, your professor will discuss topics that appeared in your textbook. If you're already familiar with the topic being discussed, and took good notes as you read your textbook, you won't need to write everything down. As you listen to your professor lecture, simply compliment you're reading notes with new information and insights you learn during lecture. Pay attention to which topics are important to your professor. Some professors are direct and will tell you which points and topics are more important than others, while others will not. It's your job to determine which are the most important points made during a lecture. If in doubt, raise your hand and ask. Your notes should be legible and organized. It doesn't do any good to take notes that you can't go back and review later. Immediately after each lecture, review your notes to make sure you understand everything you wrote down while the lecture is still fresh in your mind. If something you wrote down is unclear, clarify it. Organize your notes by topic, then years, decades and centuries. Use asterisks, arrows and other notation devices to identify information that is really important. Always record the date and title for each lecture in your notes. Recording the date and title in your notes for each new lecture will allow you to refer back to specific lectures when writing an essay or preparing for an exam. Also, make sure your notes follow the order in which your professor presented information during the lecture. Pay attention during movies. Rarely will your professor show a film during class for purely entertainment purposes. If your professor has scheduled a film, pay attention and take notes. It's very likely that your next exam or essay will ask you to consider a specific topic that was addressed in the film. If you're not sure if you need to take notes, ask your professor. Many of the skills and strategies required to study history are the same as those used to study other subjects. If you want to improve your study skills and performance in your history class, we also recommend you review the following articles and study skills guides.